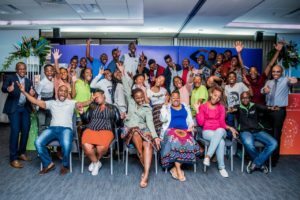 Congratulations to the nine JA alumni who recently graduated from the pilot Accelerator Programme, made possible through a partnership between Investec and the SABS Design Institute. 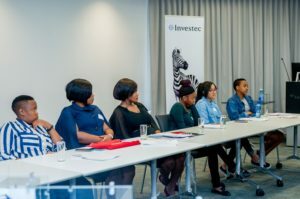 The nine participants attended JA programmes and then went on to become winners at Investec’s Junior Innovators Competition before being selected for this process. 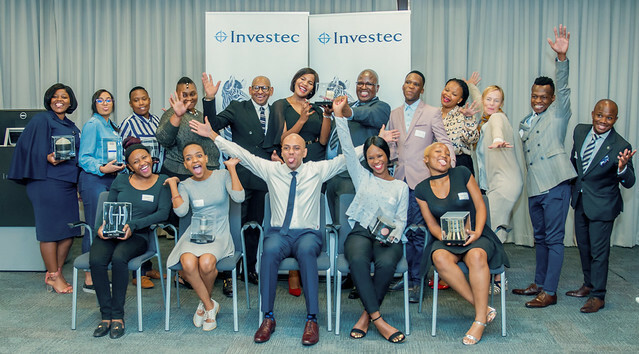 The graduation ceremony took place at Investec’s offices in Sandton, Johannesburg on Tuesday 3 April. Graduates were joined by Investec, SABS Design Institute and JASA staff members. 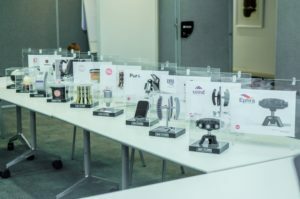 The Accelerator Programme provided an opportunity for the participants to refine their business ideas and develop 3D prototypes of their products, under the guidance of SABS Design Institute staff, over the course of a year. One of their mentors, an industrial designer at the SABS Design Institute, Sibusiso Mkhwanazi, explains the process. 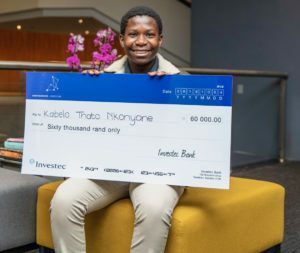 Another graduate, Lebogang Mogale, also from Sandtonview, explained how thinking through her idea uncovered some complications she had not expected. This is common in the early phases of developing an idea and thus it is important to be flexible. It was through figuring out how to deal with complications that the product evolved into something better. “Learning to accept criticism enables you to collaborate with other people and be creative and invent things together rather than just sticking to one idea. You need strategic relationships – these are the people who are going to be honest with you and urge you to do your best and push you to work hard. I was very shy when I started at JASA but not anymore. There is no place for it. Leave you shyness in your suitcase,” Mogale said. 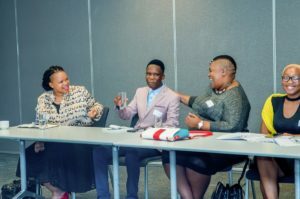 Ashley Dhlamini started her entrepreneurial journey in a JASA programme at Dawnview High School in Germiston, Gauteng, in 2015. 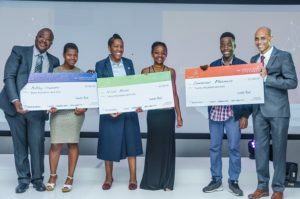 She introduced herself as an inventor and an economist in the making and explained how the idea she came up with for JIC has evolved through the Accelerator Programme to become a unique innovation that utilises existing technology in a new way. She remarked on how most of the group had developed their initial ideas in new directions but that this was good because it helped them to shape better products. The path to refinement may seem long but it really pays off. “Pressure makes diamonds and look at me here. We spoke to strangers, people who didn’t believe in our ideas and people who were busy, but here we stand together. Nothing works better than simply an improved product,” she said. 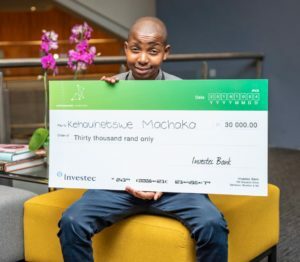 Sibusiso Mkhwanazi, an industrial designer at the Design Institute who worked closely with the programme participants, gave a glimpse into the process. A product begins with an idea, in a sketch or in words on paper. This can be very rough at first but through development it can turn into a unique innovation. Once the idea is more refined then the next step is to create a computer-aided design (CAD) drawing from which a model can be printed in 3D. Having something solid is useful to show potential investors. In addition, a model forms the basis for creating a fully-fledged prototype. To do that involves the next step of accessing the suppliers, technology and engineering support needed. 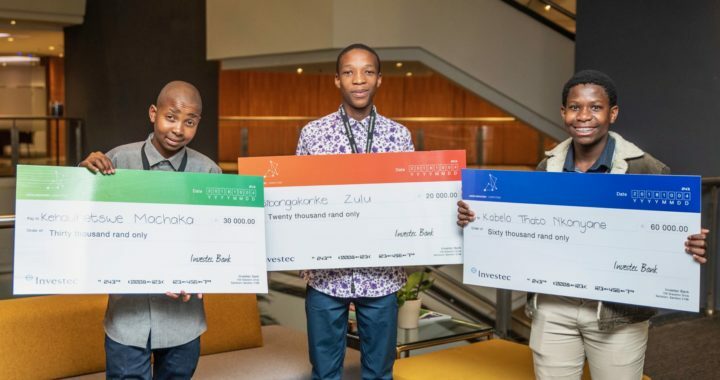 Mkhwanazi and his colleague did a global search on the innovations being developed by the accelerator programme participants and, in some cases, they could not find a counterpart in the world. In one case, a similar product was in development in the US but that means the South African market is open for a similar product to be patented. 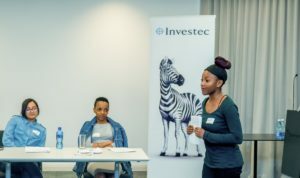 Investec and SABS are in discussion regarding how they can support these entrepreneurs on their journey further to continue with the rapid prototyping phase and find investment to take their products to market and to develop their businesses. 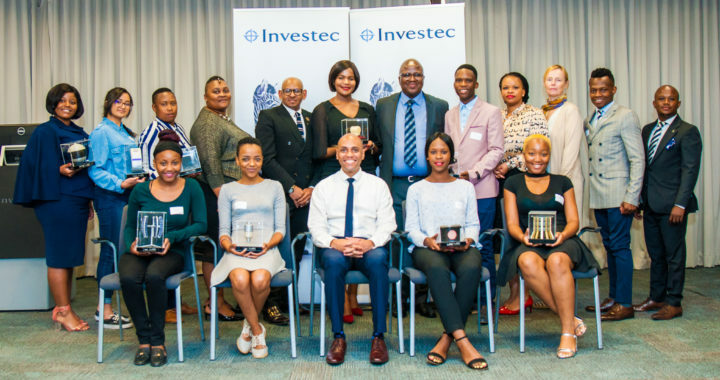 Setlogane Manchidi, Head of CSI at Investec, congratulated the graduates and urged them to realise their visions of making a mark in the world. In his address, SABS Design Institute Head Gavin Mageni emphasised the importance of entrepreneurship as a creator of opportunity in our current economic landscape, where jobs are scarce. He explained how innovation had made a resurgence in the past decades with the SABS Design Institute leading the way. The Institute was founded in the Apartheid era as a reaction to sanctions, when imports into South Africa came to a halt. As a result, the Department of Trade and Industry were tasked with driving innovation internally since the country could not rely on sourcing from outside its borders. Though the world was not supposed to do business with South Africa, curiously, exports out of South Africa were not restricted. During this time, around 700 innovations were developed and many of these were exported around the world. Then, after Apartheid ended, the focus shifted and innovation became neglected. However, over the past decades, innovation has once again became a priority and this accelerator programme is but one to create a resurgence of innovation, business and prosperity. For more photos please see our Flickr album by clicking here. 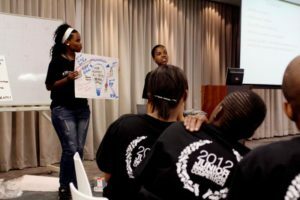 On Sunday, 30th September 2012, 45 learners from across South Africa made their way to Sandton, Johannesburg, to compete for the chance to become the first ever Junior Innovators winner. 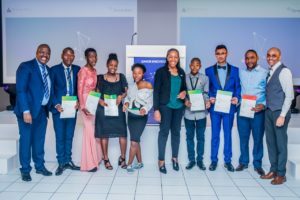 The learners had been selected from over 100 entries received. To enter, they were required to identify a problem in their community and develop a socially innovative solution to it. They also needed to write a letter of motivation and obtain a letter of recommendation from a community leader. The competition, generously funded and supported by Investec, was held in Sandton, between 30th September and 3rd October 2012. During the four days, the finalists attended various workshops, specifically designed to help develop their concepts into full five minute business presentations. They were also lucky enough to attend talks from several high level corporate individuals and successful entrepreneurs. On the final day, the finalists were required to present their concepts to a panel of judges, who then selected the top ten. The presentations were all astounding and the innovations presented were inspiring! The top ten finalists were then required to present their concepts to another panel of judges, as well as their fellow contestants. 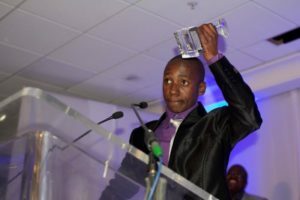 The event culminated in a spectacular evening titled, Night of the Stars. The finalists all dressed up in their finest formalwear and were treated to exclusive red carpet treatment—literally! On arrival they were swarmed by “paparazzi” whilst trying to make their way down the elegant red carpet. They were treated to spectacular food and entertainment, by none other than DJ Dino Bravo. 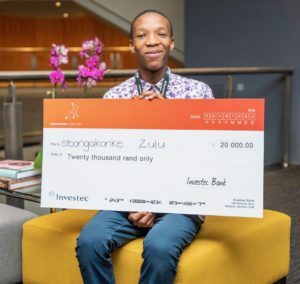 First prize, of R60 000 towards his studies, was awarded to Sifiso Motaung from Sandtonview Combined School for his Urea Fertilizer concept, an organic fertilizer made from purified urine. 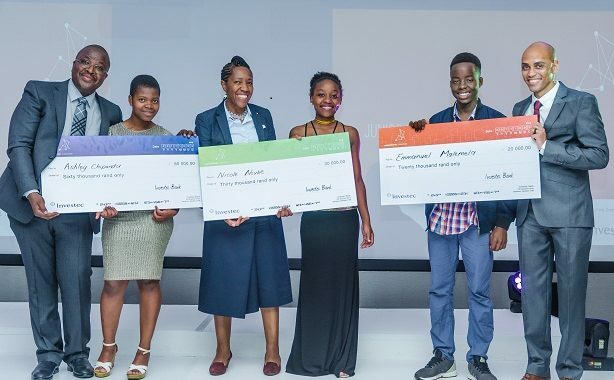 Second prize of R20 000 went to Snethemba Gasa, from KZN, for her shopping packet carrying service and third prize of R10 000 went to Beacon Secondary School learner, Lindokuhle Sithole, for his brilliant Solar Mill concept!